For your convenience we accept all four major credit cards. For security purposes all credit card payments are processed by Internet Secure, one of the leaders in providing safe and quick online payment processing. You have the option of ordering online or phoning in your order. You can also contact us with any other payment option convenient to you and we will be happy to provide the guidelines. The shipping will be done via FedEx and the charge will depend on customer's location and urgency of order. For North American customers overnight delivery charge will be around $50 US and 5-day delivery will cost around $20 US. To our worldwide customers we will quote the shipping on a case by case basis. Since all our items are custom made, please allow 15 business days from the order date for the delivery. Are the rings insured in transit? Yes. Every item that we ship is insured from the time it leaves our location to the moment it arrives at your door. All our products are custom made especially for you and unfortunately cannot be returned. We are positive that you will be completely satisfied with your purchase. Please be careful when determining your ring size. Refer to our How to measure your ring size page or go to any jewelry store and ask them to measure it for you. Also, when ordering carefully review all the information before making the final purchase. Read about the quality of our items in the Warranty and About Us sections. The majority of our diamonds have certificates attached to them. When you purchase a loose diamond or a diamond ring, we ship it to you with the Diamond Grading Report from either GIA or AGS. These laboratories are recognized around the world as the best in diamond grading and our customers can be confident that the diamond being purchased by them is exactly the same as in the certificate accompanying it. Can I buy an Engagement Ring setting/or Diamond only? Yes, if you already have your diamond or, follow the steps outlined on the Custom Build Your Engagement Ring page and buy a setting only. On the same page you can also purchase diamonds without a ring. Can I replace a diamond with a colored gemstone on a particular setting? Can I send you my item for engraving? 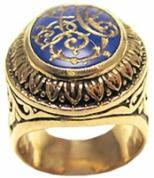 Yes, we pride ourselves on our ability to perform hand engraving on most jewelry items. 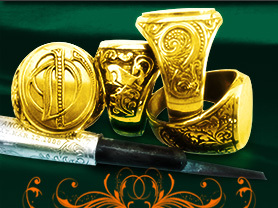 We believe that nothing makes a piece of jewelry as unique as quality hand engraving done by an experienced professional. 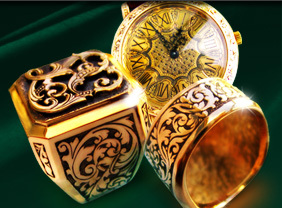 Ask us for a quote and we will be happy to transform your jewelry into a work of art. What kinds of engraving styles are available? We are able to perform any custom engraving on all the items. If you have a special image that you would like to see on top of the Signet ring or a special ornament on the side of a ring e-mail it to us info@almaridesign.com. Please, provide the model number and we will reply with a quote as soon as possible.